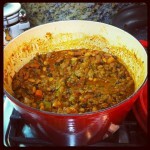 Author: Hip Foodie Mom, adapted from Big Mike! Heat oil in a large pot or Dutch oven over medium heat. Add the onion, bell pepper, and carrots, cover and cook, stirring occasionally, until vegetables are soft (roughly 10-12 minutes). Add the cumin and cook for a couple of minutes. Add the ground beef and jalapenos (if using). Cook beef until no longer pink, breaking up clumps of meat. Stir in tomatoes, 2 cups of water, green chiles and juice, chili powder, oregano, sugar, salt, and pepper. Stir together until all ingredients are well-blended. Cook partially covered for 30 minutes, stirring occasionally. Add all of the beans and 1 cup of water, and cook for an additional 30 minutes. Season to taste with salt and pepper. Top with shredded cheese and 1-2 dollops of sour cream if desired.